For a while, cookie dough truffles were everywhere — especially on Pinterest, where eggless versions of raw cookie dough balls dipped in chocolate ran the gamut from dough balls made with yogurt to cannabis. During their peak level of popularity, I wasn’t particularly interested in cookie dough balls and ignored the recipes in favor of actual baked goods. But lately my tastes have leaned toward no-bake, chocolate dipped treats, and I had the urge to finally try chocolate chip cookie dough truffles. Not the cannabis ones! I tried a few different cookie dough truffles, and out of the three I tried, the version made with condensed milk was the winner. The other raw chocolate chip cookie dough truffles were kind of flour-y tasting, but adding condensed milk offset the flour and gave the trufffles a nicer shape. In addition to the first condensed milk version (which I found on Taste of Home), allrecipes.com had a similar one that called for toffee chips. This one was the best! The toffee chips took the truffles to the next level and I would never leave them out. Another thing I found was that they tasted better after they’d been frozen for a day or two. Some, but not all, of the grittiness was gone and the centers were smoother. They also froze very well. 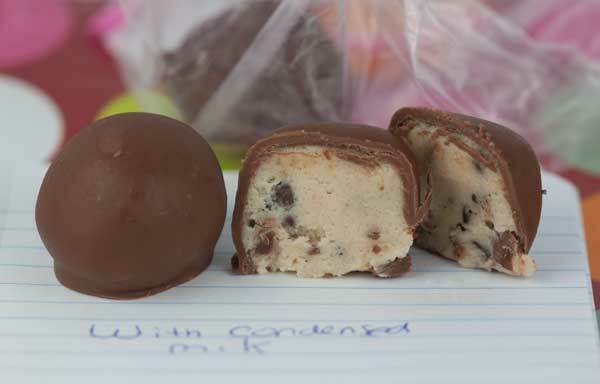 Chocolate Chip Cookie Dough Truffles are raw cookie dough made with condensed milk in place of the eggs. These have a smooth texture and a not-too-floury taste. Beat the butter and brown sugar with an electric mixer until light and fluffy. Beat in the vanilla extract. Add 2 cups of flour alternately with sweetened condensed milk and stir until smooth. At this point, taste the dough. Add the remaining flour only if the dough is too loose. Fold in the chocolate chips and toffee bits; mixing just enough to evenly combine. With a cookie scoop or a tablespoon, scoop out small mounds of dough and place them on a foil or parchment lined cookie sheet. Put the sheet in the refrigerator and chill until the dough is firm enough to shape into balls. This should only take about 40 minutes. Shape the cold dough into smooth balls and put them in the freezer until ready to dip. Chop the chocolate and melt it in a double boiler. For thinner chocolate, add about a tablespoon of coconut oil. Alternately, you may melt it in the microwave using your favorite method. Keep the melted chocolate just slightly warm and the cookie dough balls very cold so that the balls don't fall apart in the chocolate. Dip the dough balls in the chocolate coating, allowing any excess to drip off. Set them on a foil lined baking sheet and refrigerate until chocolate is firm. You can do it either way, actually. The part that tastes better is the middle part (it just seems a little smoother after being frozen and thawed), so you could make all the middles, freeze them and dip before packaging. You could also dip and then freeze. When you say they taste better after freezing for a few days, do you mean you freeze them for a few days BEFORE you dip them in chocolate, or you freeze them for a few days AFTER they’re dipped in chocolate and completely done? My daughter’s ballet teacher is requesting truffles, which don’t sound very fun to make, but these sound much better! Very fun and easy. They definitely do taste better if you let them sit a day or two in the freezer. These look/sound really great, Anna.. I just might (hope) I can get the ingredients and time to make these before Easter. since your better after freezing ….. it does sound possible! I made a version of these over the holidays – Jeff and Alexander loved them! I know what you mean about the floury taste, I’ll have to try this version to compare. Thanks for the pin, Pat!! These sound so yummy, Anna. I had to Pin it.